Are Brushless Power Tools worth it? 2012 was the year that brought brushless motor technology to the world of power tools. The new brushless models are being promoted by the manufactures as being significantly better than the brushed motors we have been using for decades. 50% more power, 130% longer life, ...Let's cut through all the marketing hype and take a look at what a brushless motor can actually do for you in your power tools. For an electric motor to turn, the magnetic field in the motor must change. As the field changes the rotor is forced to move to return to its neutral position within the field. 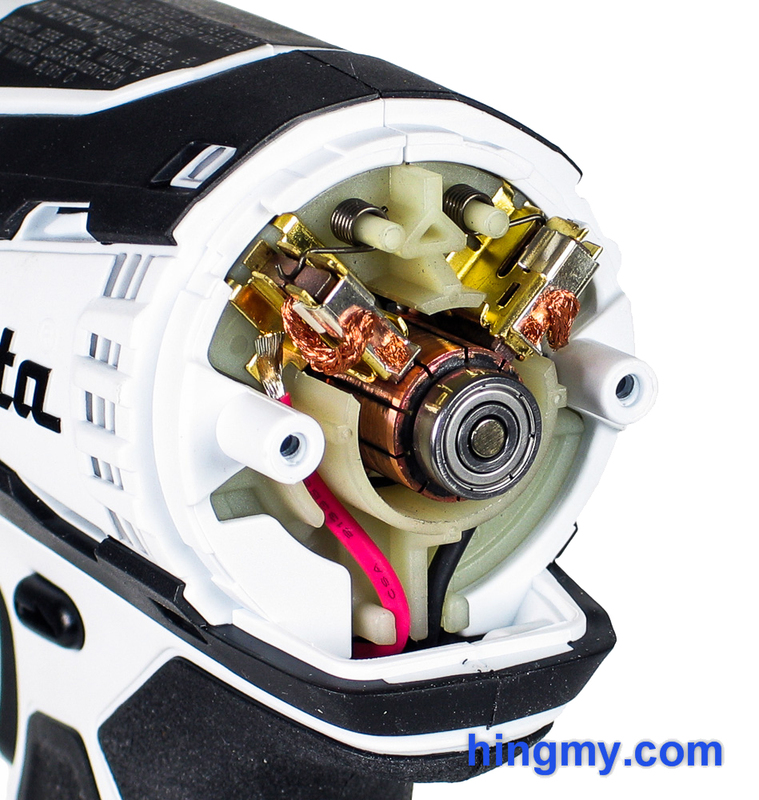 The control mechanism of the motor changes the field in such a way that rotor keeps spinning continuously. A brushless motor uses a digital circuit to change the magnetic field in the motor; the task that is done by graphite brushes in a brushed motor. The brush system is a mechanical system that has been used since the early days of the electric motor. While it undoubtedly works, it's efficiency and reliability are limited by how small it can be built and remain functional. Replacing the brushed control system with a digital circuit removes many of the limitations. A small chip can control the motor more precisely and in different ways than an analog/mechanical mechanismcan. This results in a number of benefits brushless motors have compared to their brushed predecessors. Higher torque per weight: Brushless motors produce more torque compared to a brushed motor of the same weight. Eliminating the brush assembly and the windings on the rotor allow for the stator to be larger. As a result a brushless motor creates more torque. Higher torque per watt: Brushless motors make more efficient use of available power in low to medium-load scenarios. 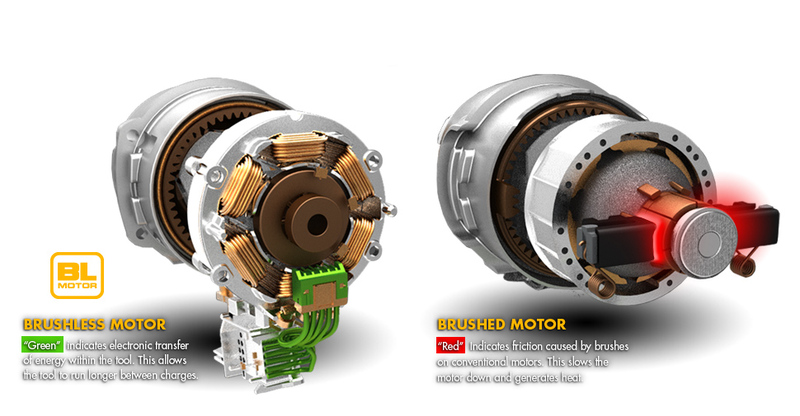 Under high torque scenarios brushless and brushed motors perform virtually identically. Manufacturers tend to promote the larger performance gaps that exist in low-load scenarios. It's important to note that this performance difference all but vanishes at full load. Increased reliability: Brushless motors are more reliable due to the reduced number of moving parts. Since they do not have any brushes that must be replaced, brushless motors are maintenance free. The digital circuit adds awhole different set of failure modes to the motor, but the overall system is more reliable. Reduced noise: The brushes of a brushed motor create much of the very distinctive noise of a running electric motor. Sparks fly as one circuit is broken and another is closed. On a brushless motor none of this is happening. The friction caused by the brush is eliminated, and the motor run quieter. Longer lifetime: The overall system live of a brushless motor is higher than that of a brushed motor. This primarily due to the lower mechanical complexity and superior heat management of the brushless design. For a motor to reach its maximum life, however, it must be well designed and implemented. A cheap motor still is a cheaper motor. Lower electromagnetic interference: A magnetic field, especially a moving one, creates electromagnetic interference (EMI). EMI, as the name suggests, interferes with other electromagnetic fields used for other task. A brushless motor produces less EMI than a brushed motor. EMI becoming and issue at home or on the jobsite is so unlikely that manufacturers do not promote this particular benefit of brushless motors. It must be mentioned here purely for completeness. No windings on the rotor: A brushless motor can use a permanent magnet in place of windings on the rotor. This makes the rotor lighter and smaller. The stator, in turn, can be larger. This not only makes the motor more powerful, but also makes heat management easier. The motor can be fully enclosed and cooled with fins. This in turn increases service life. Are tools with brushless motors better? Brushless motors are a better implementation of the electric motor than a brushed motor in hand tools. In the future all hand held power tools will be equipped with a brushless motor. The new design allows tools to be lighter, more powerful, and longer lasting than ever before. Brushless motors, however, are not the final answer in power tool design. The designers must still decide which size of motor to install in each tool. The factories must still build the tools as well as they did the brushed models. Ingenuety and quality are still very important. For this reason one must clearly say that a tool with a brushless motor is not immediately better than tool that uses a brushed motor. As before, a quality tool outperforms its inferiorcompetitor in many ways. The motor is one part of many.For many years to come many tools with brushed motors will outperform their new brushless competitors. Brushless motors are an exciting new development in power tools. They are more powerful, more efficient, and quieter than the existing brushed motors. In the next few years power tools will become more power, lighter, and longer lasting; but not necessarily all in one tool. While brushless motors are undoubtedly a better design, they are not the single indicator of a quality tool. All the components of a tool, of which the motor is one, work together to make the tool perform. Shop for a good tool, not a good motor.